A Vintage Tea Party is cute, kitsch and comfortable! Perfect for; Weddings on a budget, Intimate weddings, Green Couples. If putting together your own mismatched tea set, consider giving the cups and saucers to your guests as favours at the end of the night. Use old birdcages or candelabras as centrepieces. As well as cups and saucers make sure you show off your pretty cakes and sandwiches on tiered serving plates for that authentic look. Hang bunting on trees and around tables. You can make this easily yourself if you are on a budget. Make tea bag tabs with each guests name on as place markers. Use country flowers from friend’s gardens. Use vintage jugs or tea pots with flowers in as centrepieces. Use old glass bottles (again you can collect a variety of these from charity shops) and put a single flower in each. Line these up as decoration. Use vintage music sheets to wrap the bouquet. Hang or stand large painted letters spelling out words to capture the mood. Go for a summer picnic theme and use picnic baskets filled with goodies as centrepieces. Pick flowers that compliment the mood. Have a look at TheUrbanFlowerFirm.com. Hire a band that dress in vintage clothing or that play music from specific decades such as the 20’s or 50’s and 60’s. “The Charleston Charlies” a 20s style band. This band captures the heart of the Roaring 20’s with their fun loving, mischievous performance. 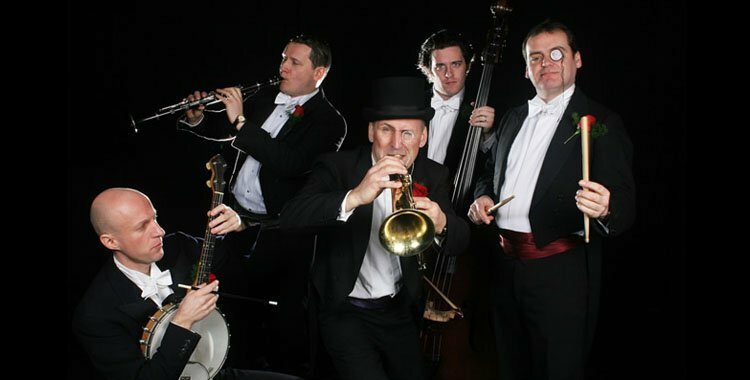 The band are known for playing the best in 1920’s Jazz that will get you dancing like cats on a hot tin roof! 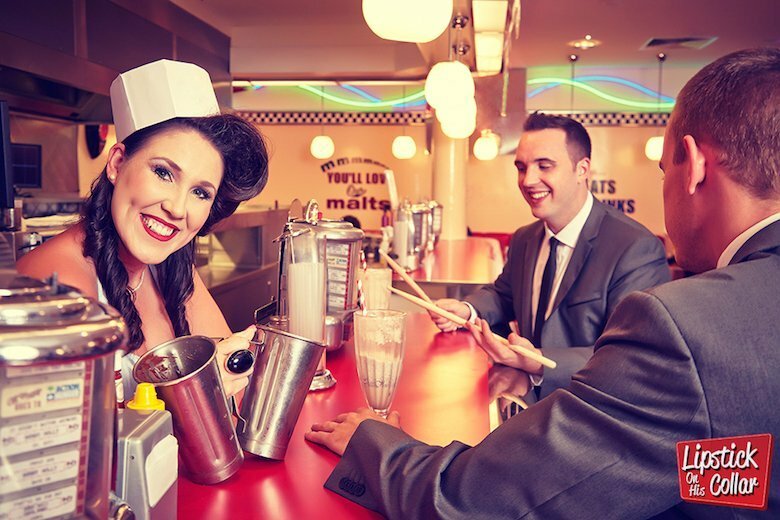 Lipstick On His Collar are an exciting 50’s / 60’s showband, specialising in bringing the Classic Pops hits from the Golden Era of music back to life. With authentic vintage style costumes to add to the sense of occasion. Classic music from Connie Francis, Buddy Holly, The Ronettes and The Beatles to name but a few! 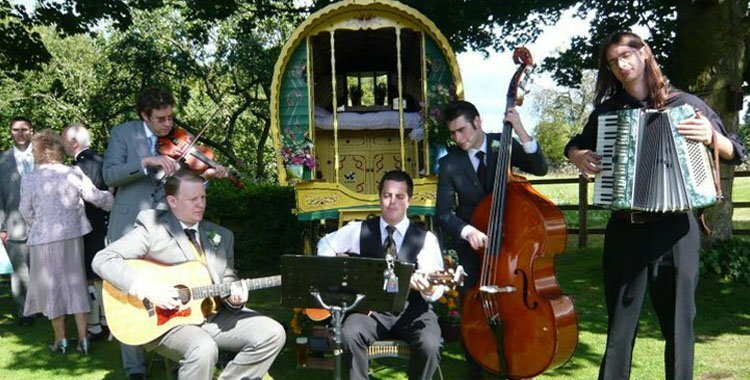 Or maybe think about hiring a gypsy jazz band that could play outside while your guests mingle. Buy or make hanky’s/napkins embroidered with each guests initial. Bake up some little gingerbread boys and girls, cupcakes, or biscuits in the shape of tea pots and cups, then ice them in pretty pastel colours. Get hold of some old fashioned sweets and put them in a little box tied with a bow. Make fortune tellers to keep your guests entertained – open to reveal fortunes and riddles. Perfect if you’re taking inspiration from Alice in Wonderland’s Mad Hatters tea party! Put different flavoured tea bags in little cards with a fitting poem. Buy small bars of chocolate and replace the wrappers with your own personalised ones. Instead of throwing the bouquet make it so that you can divide it up, and give a single flower to all your unmarried friends as a sign of happiness for the future. Afternoon tea with sandwiches and petit fours. You can order beautiful cupcakes at The Fluffy Cup Cake Company. Take a vintage vogue wedding dress pattern to a dressmaker and have them make you an authentic and one off dress. Wear your mothers wedding dress or accessories. To keep the kids entertained have old fashioned games such as skittles, hoopla and hopscotch. On the tables smaller games such as tiddley winks. Hire a face painter or caricaturist. Take a Polaroid picture of each guest and get them to write a message on the bottom. After the wedding make these into your guest book. Hire a photographer that will capture the mood. Have a look at Oscar-and-Rose.co.uk.